Tagged under Barasui, Daume, MOVIC, Production Reed, Series. Chika Itoh, a typical, well behaved 6th grade elementary schooler is always on the look out for two things - her older sister Nobue coming into her room to 'steal' some money to buy more cigarettes, and her next-door neighbor friend Miu jumping into her room through the window. Other than that, she has two other friends - shy, but adorable Matsuri and a new entrance English girl, Ana. 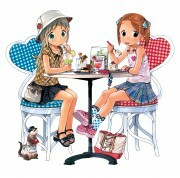 Ichigo Mashimaro is all about their time together and all the cute things they do in life. The presentation of this is series is befitting to itself in every fashion. Every aspect of Ichigo Mashimaro goes towards emphasizing on the cute girl factor. The music is very catchy and memorable, the animation is soft and very cute, the episode stories are also quite appealing as each one has a way of providing some sort of humorous occurance. The balance of the series is also well balanced for it's appeal. The cutestness is heavily emphasized but it is done so in such a way that it is simply cute and not overdone. 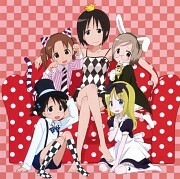 Fans of Azumanga Daioh and other cute series will find Ichigo Mashimaro at the top of their list of favorite anime. This series is by far an excellent addition to any collection of cute collectors. scenes of everyday life that gone wrong. characters ok, tend to be childish like. intended audience likely young. artworks show softness and tenderness which matches characters and story settings. seiyuu average performance but the main two girls are noticeably good.